Last week the subject at Avon Valley Artists was a `Still LIfe' it being said this could be flexibly interpreted. Since moving, a year past September, my painting activities have reduced and I've been somewhat lacking in motivation. Hopefully this is improving and so I decided to take another Portrait course at the College of Bath Further Education in order to move the process along. This is the same course I took a while back with the same tutor Jackie Harding. It combines both drawing and painting and both head shots and full figure drawings/paintings using different drawing mediums, although when we come to paint I'll stick to watercolour. Jackie has a low key approach and we are into drawing immediately after a short introductory talk. The sessions are 10am until 12.30 and it is a ten week course. I obtained permission to take the following photographs. This lady is one of the models we had last time. I've forgotten her name but she is coming again next week so I'll remedy that. This is the approximate view I had with my easel on the left of the photo. She wasn't quite as far away as she appears, camera distortion, but sufficiently so that her features weren't easy to identify. This is my finished drawing. I've cropped it a little as the original is on A2 sketching paper. The college has a shop with a limited range of art materials, such as sketch pads, paper etc, on sale at very cheap prices. The cafe is similarly good value! I used Faber Castell graphite pencils 2B, that I made sure were very sharp. After sketching the general outline I then drew the features checking distances, spacing etc constantly. In her short initial talk, complete with a sheet she gave us that had illustrations and an excerpt from Betty Edwards 'Drawing on the Right Side of the Brain', she. emphasized the principals to follow regarding the correct proportions of the head and not drawing what you thought was there be but by careful observation what they actually are. Rather than use a pencil for measuring I have some spacing sticks I've made from thin garden stakes, marked in inches. Possibly I should go back to using pencils, but normally I use mechanical pencils which aren't so useful for measuring. Jackies method is to go quietly round the class then suddenly she is by your shoulder suggesting this or pointing out errors. I might add I was constantly erasing and re-drawing throughout the session. For example she pointed out on one occasion that the height of the top half of her head, basically the hair, was too short in relation to the face, on another certain angles were not quite right. I think there were seven students in total but another two were possibly missing on the day. The first three sessions are drawing then we move on to painting. We have the same model next week but the drawing session will be varied, not sure exactly how but possibly using charcoal. Pat from my AVA group is also a student and thoroughly enjoyed it as I did. The only problem we had was finding a parking space in the Park and Ride. For a first session, warts and all, it went quite well and I was pleased with the result. This was the subject at the latest Avon Valley Artists session with 11 members present. As you can see this allows for a wide interpretation which is a theme of many of our subjects. Pauline used a lot of texture on this. I think she put tissue paper on prior to painting. Not sure who this was??? This is my `secret` indulgence a BIG (full English) breakfast. Actually I'm not allowed it very often, only cornflakes or porridge! The main focus of the painting was the eggs. I thought if I got them right the rest would take care if itself. An interesting selection I'm sure you'll agree. This is the completed portrait of the actor Emily Blunt. I've heard of her but she is one of the younger generation while I'm one of the older ............ The inspiration was a cover photograph in the Observer weekend magazine. Emily Blunt - modified version with hairline softened in places. Which is better? I'm reasonably happy with this but getting my excuses in first fall back on Charles Reids exhortation `to be cruder', and also his view that `mistakes' are part of it! I can always see where things could be better but what the heck! IF I can capture the `essence' of the subject then I'm reasonably content. I think this has been achieved although you may disagree. I first made a pencil drawing as accurately as I'm capable of without too much detail using a Pentel mechanical pencil 07 2B. I then painted in two stages, the first session at the AVA and completion yesterday. Brushes were my usual Isabey Kolinskys ranging from the retractable No 6 to the 6228 No 8. As I've emphasized before the retractable is a very slim brush quite unlike a `normal' 6 - much smaller. In any event Isabeys tend to be slimmer and smaller than some other makes. I do like them though. My primary concern is getting the features right starting with the eyes. I don't aim for a perfect representation but at least hope the subject is identifiable. I'm trying not to be too complicated with the rest, especially the hair. I've still not satisfied with this aspect. Colours used were Cadmium Red LIght, the main colour, with small amounts of Raw Sienna and Cerulean to darken the mixture. I also used some Ivory Black for the eyelids. The hair is mainly Ultramarine Blue, Translucent Brown (Schminke) and a little Raw Umber. The yellow is Hansa Yellow Medium (Daniel Smith). We had a very small attendance at the latest AVA meeting last Thursday, possibly due to the weather - it was raining `cats and dogs'. The subject was trees, an easy one you might think. I again had difficulty in focussing on the subject but eventually came up with the following based on a photo I `googled' on the ipad. This is part of a large tree where a large branch was cut off and someone has then carved the face. I've no idea what or whether it symbolizes something in particular. I used several colours, arbitrary in Charles Reid's words - colours that aren't actually there. I found it difficult, especially as there is a lot of texture in this particular tree and I'm not much pleased with the painting. As I finished early - I usually do - I started work on a portrait that I'd drawn earlier in the week. This is based on a photograph of the actor Emily Blunt in one of the weekend colour magazines. They are a good source of portrait material. This is the work I did at the AVA session and I completed the painting at home this afternoon. I'll post the final painting in the next two days. 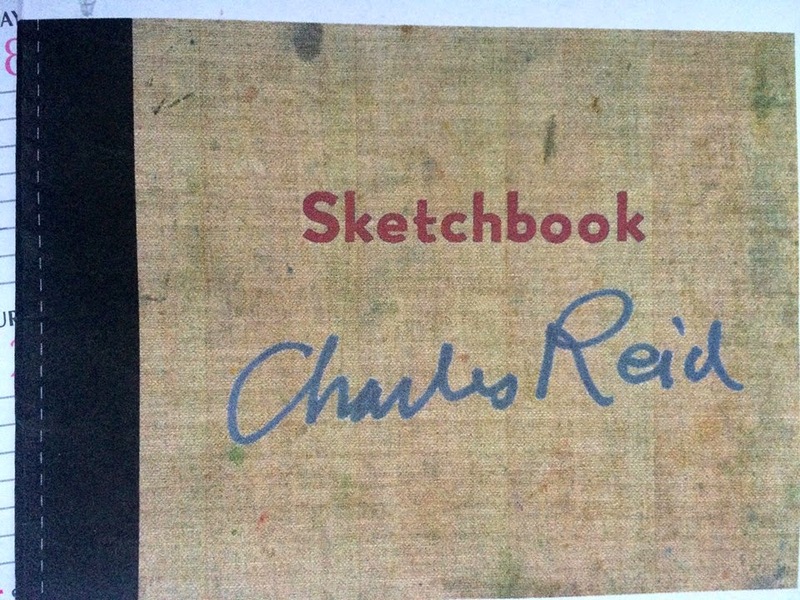 Just announced a new Charles Reid book called `Charles Reid Sketchbook'. This is a collection of Charles sketches from over the years and is not a new `How to' book. Apparently he has received many requests in the past from his students to buy his sketchbooks so this is the result. I, and others, did ask him to produce a new portrait book but he decided that `Watercolour Solutions' - excellent indeed - was to be his last. However this book was obviously easier to produce and so we now have it. It seems the book is self-produced, an increasingly popular process possibly due partly to disenchantment with the way some publishers are behaving. I experienced this myself with my last book some years ago. Charles mentioned he had been unhappy, especially because he had several changes of editor - I recall he said three - when he was writing `Watercolour Solutions'. I have most of Charles books on watercolour, the only exception being the first flower book, There are many examples of his sketches in some of them. Personally I've never done much sketching - something many will be critical of - and have never made a painting from a sketch. It is just something I've found very difficult. Because of this and the fact I find the price on the high side I won't be adding this to my library but I'm sure many will. Obviously if I don't buy the book I can't review it but if any readers do I'd be happy to add a review to this piece.